Come join us at the table this week, Barbie, Frank Zappa, and Hernando de Soto are in town. We’ve got a great week of food just for you, come join us at the table, we’d love to see you! 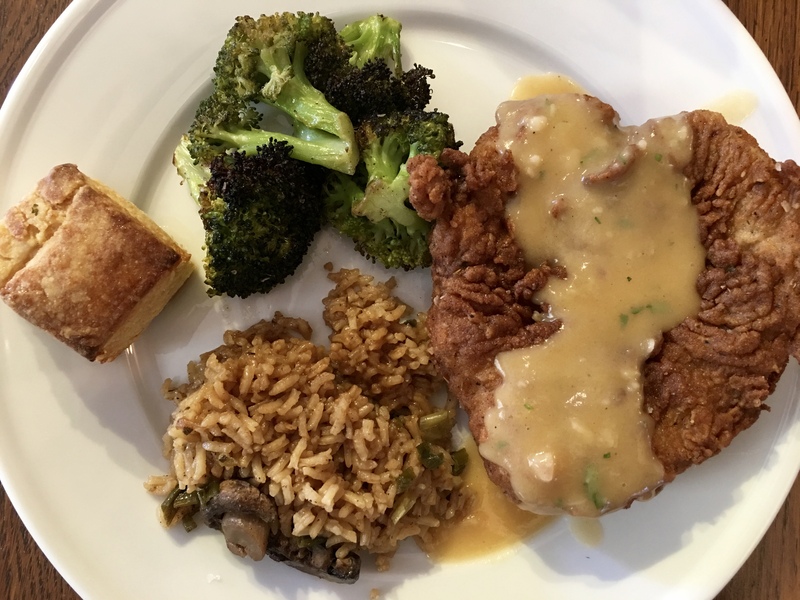 Here’s what’s cooking for you this week: red beans & rice or gumbo, fried pork chops with zipper cream peas, and fried catfish po-boys. A special red beans & rice or our own dark roux gumbo. Try our special recipe red beans with lots of extra vegetables served on rice or own special dark roux gumbo. We make our gumbo with a dark roux, chicken, sausage, and the trinity of bell pepper, onion, and celery. Oh, Grandpa Justin would add sauterne wine, a cup or two or three, and so do we. Well, she made her society debut this month way back in 1959, and the world hasn’t been the same. Modeled on a German doll called “Lilli,” she first reached the market as a racy adult gag gift in tobacco stores. But, strangely enough, she became very popular with children. You’ve probably already guessed it — our 11″ tall blond bombshell is Barbie. Well, come grab some red beans or gumbo, Barbie and Ken are camping in their pink Winnebago out back, waiting for their gumbo. Fried pork chops with gravy, zipper cream peas, and cabbage sautéed with hog jowl bacon. Blissfully slumbering overnight in a special saucy boudoir of buttermilk and seasonings, these pork chops will ceremoniously swim with their special flour bathing suits in a big pot of hot and lovely grease, and they come served with garden fresh zipper cream peas sided by some cabbage sautéed with hog jowl. Porkalicious! Hernando de Soto landed in modern-day Tampa Bay in 1539, bringing a host of soldiers, piles of European accoutrements, and, yes, 13 pigs to help feed the soldiers. By the time de Soto died three years later, the pig herd had grown to 700, not counting those consumed by soldiers or given to pacify the Native Americans. And, yes, some ran into the woods to become the feral hogs we know today. Pig herds grew quickly in settlements on the East Coast, and by the middle of the 17th century, hogs wild and domestic proved a serious problem to crops settlers grew. On Manhattan Island, laws were established to curtail the ravaging pigs, and a special wall was built in New York City to help control the pigs. Yep. You guessed it. Wall Street. Such humble origins for a storied street. One wonders if things have changed all that much on Wall Street…. Fantastic Thursday: Fried catfish po-boys ($13.50). We take some specially battered catfish, fry it nicely, add our house salad, and a po-boy bun to make a wonderfully delicious Thursday dish. The Mekong River giant catfish reaches its huge average size of 330-440 pounds in about six years. The largest catfish caught since record keeping began in 1981 weighed 770 pounds, measuring 11′ 8”. Well, that’s huge. We wouldn’t want to noodle for one of those. Sadly, because of over-fishing, the Mekong cat is on the endangered list. Come join us this Thursday as we enjoy some smaller, non-endangered cousins on a po-boy! In 1968 Frank Zappa sang a silly little ditty about love lost called “No, No, No” with these memorable words, “Left me here to cry alone, (Boppa dooayyydoo, boppa dooayyydoo, boppa dooayyydoo, boppa dooayyydoo), with a bottle of juice and a pork chop bone.” Yep. We think the “Boppa dooayyydoo, poppa dooayyydoo” backing vocals make the song. Have a listen to “No, No, No” on YouTube.